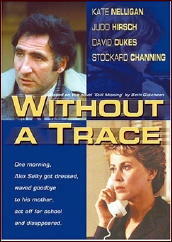 » A Movie Review by Walter Albert: WITHOUT A TRACE (1983). I remember at the time the book came out that there was some “outrage” that author Gutcheon had (supposedly) surreptitiously befriended mother Julie Patz to get material (and insight) for the book she was writing. I don’t know if there was anything to it or not. I do know the guy who confessed this year was a different homeless guy than the one they’ve always said killed the boy. I confess to not having followed the case all that closely. 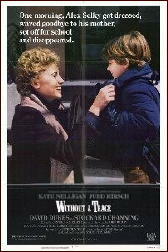 Being in Connecticut at the time, we still weren’t close enough to New York City to get the same amount of newspaper and TV coverage about the boy’s disappearance I’m sure you did, living in Brooklyn. But we get the NY TIMES now — we didn’t back then — and the recent “confession” meant the case was brought back up again and rehashed over a period of several days, so now I know quite a bit more than I had before. What’s remarkable, though, is that when I found this column of Walter’s movie reviews to post here on my blog, I had no idea that this middle portion had anything to do with the Patz case. The perfect timing was purely unintentional. OFF TOPIC OFF TOPIC ! go to the Original trailer of ‘Dark Hazard’ (1934) . The mention of PRIVATE SCHULZ puts me in mind of another British show called ‘ALLO ‘ALLO, which was a comedy about the French Resistance during WWII (!!!) They had French characters, German characters and English characters, each speaking their own language. To make this understandable they had the French speaking in a stage version of French (‘It eees, ‘ow do you say?’), whilst the other nationalities spoke in exaggerated version of their own accents. When a member of the Resistance had to speak in English to escaping English airmen, she simply went from her normal French accent to an English accent (‘I say, you fellows, how would you like a cup of tea?’) Another gag had a British secret agent who was posing as a Frenchman. He believed that he could speak perfect French, but he couldn’t. To put this across, they had him speak in an English accent, but pronouncing everything oddly (‘Good morning’ became ‘God Moaning’). I’ve never been convinced by any versions of academia that we see in Hollywood. Lecturers are played by actors, and are thus often charismatic and interesting. My college tutors always sounded like they had taken courses in boredom, delivering entire lectures in a sing-song monotone. Hmmmm, 1983. I suppose that I should have said ‘thirty years’…. I wish (well, not really) that I could remember any of the college literature courses I took, but they’ve all gone into that great sinkhole of my brain, never to return. Which is not necessarily the instructors’ fault (well, in one case it was), more mine. I wasn’t interested, and no one was going to persuade me otherwise. Yes, the 1980s are now officially 30 years old. Unbelievable. Seems like yesterday. Who snapped their fingers and let 30 years disappear just like that? Snap your fingers and make 30 years disappear ? That’s nothing ! There is an entire theory, that the history of the Middle Ages have to rewritten, because a thousand years simply did not happen ! They were, according to the theory, a medieval invention . I had a variety of teachers in college. My History professor shared dirty stories from various centuries (let us out early to watch a streaker – it was 1976). He was a very good teacher and worthy of the movies. I had a film professor who made us pay forty bucks for a mimeographed copy of his notes which he slowly and dully read to us. I had a creative writing teacher who did not know what a screenplay was (1976). I was a Business major but my goal was to write comedy. I had an English teacher and a Speech teacher tell me to stop experimenting with comedy and write seriously (essays or speeches) because that was what businessmen do.